Pork Skewers: Combine the marinade ingredients into a plastic bag and set aside. Slice pork crosswise into long thick strips about 5mm in width. Add the pork pieces to the marinade and seal the bag. Marinate in the refrigerator for about 1.5 hours, turning occasionally. Preheat the grill to medium-high heat. Remove the pork from the marinade, discard marinade. Thread the pork strips onto metal or soaked wooden skewers. Place pork skewers on grill and grill for about 2-3 minutes per side or until the juices run clear and the pork is cooked through. Prepare the dipping sauce. Whisk all of the ingredients together in a bowl and set aside until the pork is ready. Remove from the grill and serve hot. Garnish with green onion and sesame seeds. 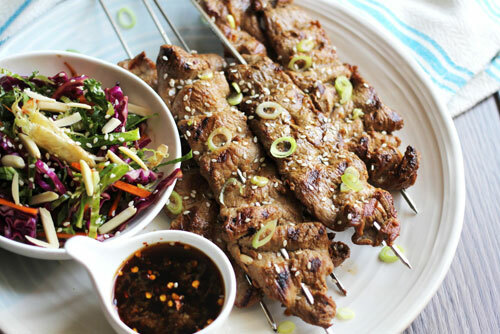 Serve the skewers with Asian Slaw. Asian Slaw: Slice the kale, red cabbage, carrots, and Brussels sprouts. Add them to a large bowl along with the almonds and the raisins. Prepare the dressing, in a small bowl combine all of the dressing ingredients and whisk them together until combined. Add the dressing to the large bowl and toss with the slaw. Serve cold with the Soy and Sesame Pork Tenderloin Skewers.